Happy New Year's Eve!!! This evening I decided to make beef fajitas for dinner. I didn't want to use a pre-made seasoning packet or marinade so I decided to make my own so I would know exactly what was in it. 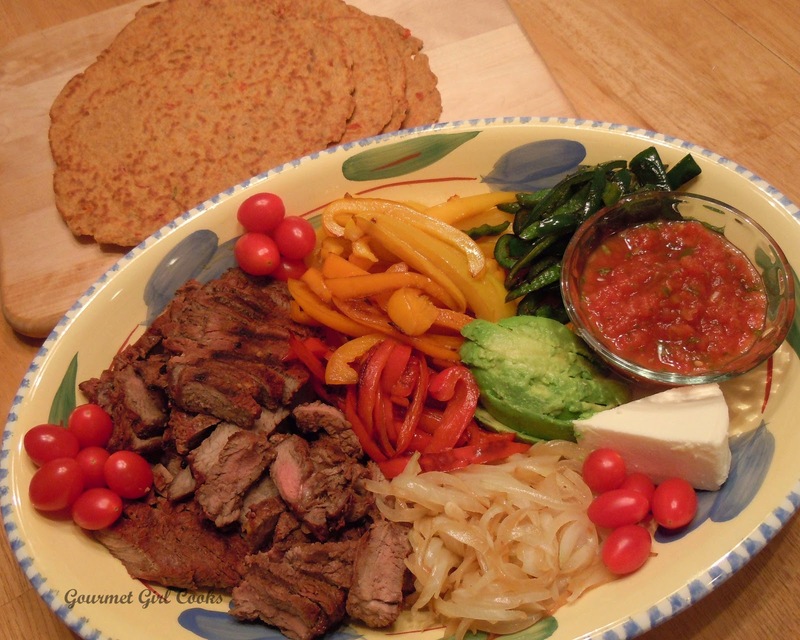 Beef fajitas are frequently made using flavorful, but sometimes tougher skirt steak. Since I only planned to marinate my beef for a couple of hours rather than overnight, I decided to use sirloin steak instead since it's also very flavorful as well as much more tender than skirt steak is. It was a simple marinade to put together and the meat turned out so tender and flavorful. These were the best fajitas I have ever had, hands down -- even better than Mexican restaurant fajitas. Tonight's meal will go down as one of my top 10, most delicious meals of 2012. I decided to use a mixture of several beautiful colorful sweet peppers for my fajitas along with some sauteed onions. I sliced orange, red and yellow bell peppers and a dark green and mildly spicy Poblano pepper to give it a little zip -- I sauteed the peppers in a little olive oil. 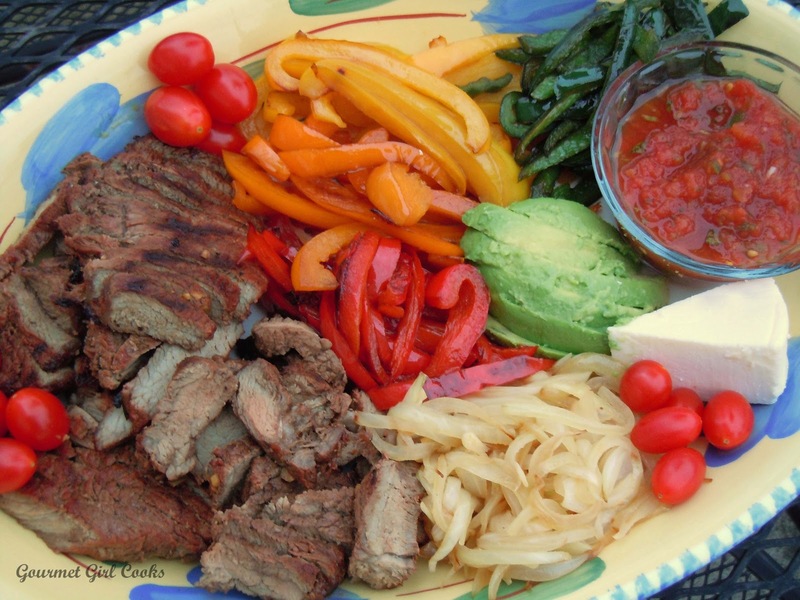 We grilled the marinated sirloin steak to give it that delicious char-grilled flavor that fajitas are famous for. 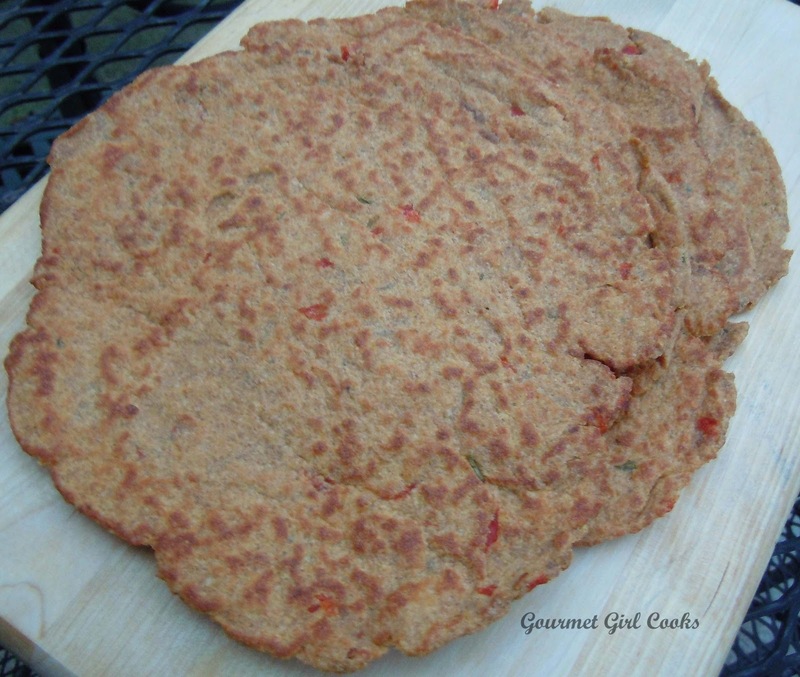 The one thing I needed to create though was a grain free fajita wrap to hold all the delicious fajita meat and veggies. I would like to report that I successfully did so! I wanted it to be flexible and not crack when rolled around my fajita filling -- and they turned out beautifully flexible and flavorful -- "mission accomplished". I served the beef, pepper and onion fajitas with fresh salsa, tomatoes, sliced avocado and fresh queso fresco white cheese that we crumbled on top. The fajitas were "out of this world" delicious! :-) I snapped a few photos below for you to see as well as the recipes for my marinade and fajita wrap. Enjoy! These were as delicious as they were beautiful! Mix all ingredients together and pour into a gallon-size Ziploc bag; add steak or chicken. Refrigerate and marinate 2 hours or overnight. Grill until done; cover and let sit about 10-15 minutes to allow juices to absorb back into the meat. Slice into thin strips. ***Note: The Chipotle Chili Powder and Smoked Paprika help add a smoky flavor to the marinade and both really compliment the fajita's flavor. In a medium bowl, mix all dry ingredients together; add salsa and eggs and mix until a somewhat sticky dough forms. Let the dough sit and rest for about 3-5 minutes. Lightly spray a piece of parchment paper with olive oil. Divide the dough into 4 even pieces and roll into 4 balls. Place ball of dough on the greased parchment paper; top with another lightly oiled piece of parchment paper and begin pressing with your hands to flatten the dough into a hamburger shaped disc. Using a rolling pin, begin rolling the dough out until it's thin (about 1/4 inch thick). Carefully remove the top parchment paper and set it aside. Heat a non-stick skillet to medium-high and lightly spray with oil. 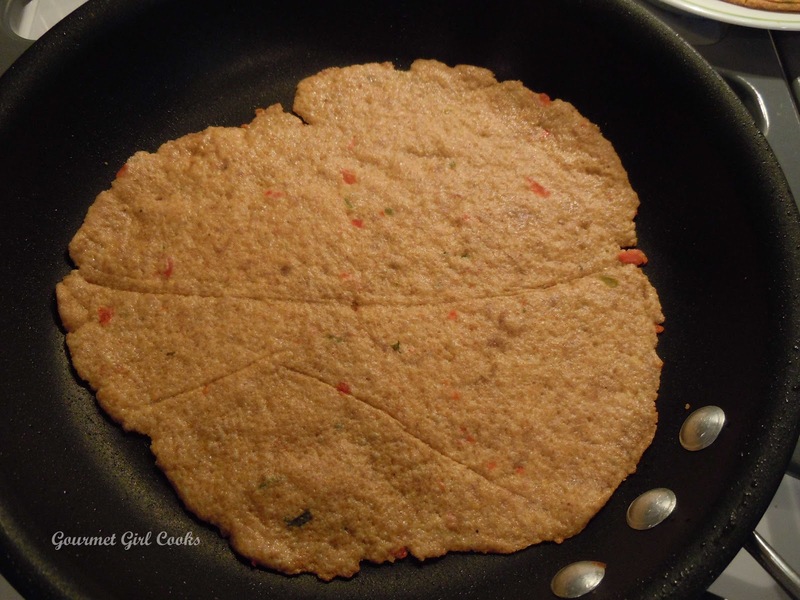 Carefully pick up the flattened dough circle along with the parchment paper and flip over into the skillet; using a rubber spatula, gently edge the wrap off of the parchment paper into the pan. Your first couple of wraps might not be perfect, but it does get easier to do once you get the hang of it. Cook for a few minutes until lightly browned and then flip and cook the other side until lightly browned. Slide the wrap off onto a plate and repeat the process with the remaining dough balls. Makes 4 8 to 9-inch wraps. Looks like you got your groove back after being sick. So great to see you cooking and making delicious recipes again. Happy New Year to you! May 2013 be healthy and tasty and grain free! I have to tell you, your blog is soooo inspiring! My son and I are starting the Whetbelly Diet tomorrow ( I have been transitioning into it for a week or so). But, I LOVE your blog! 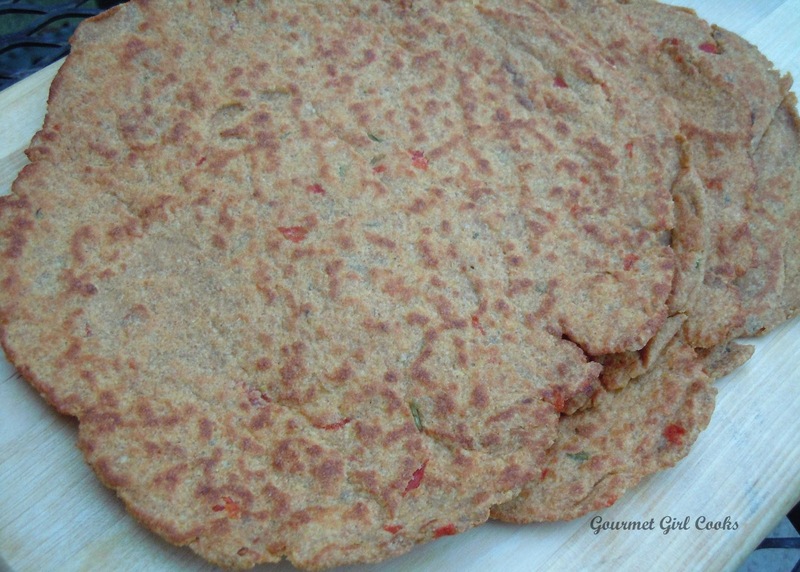 I, too love to cook- and I have been experimenting with coconut flour and ground flax. Happy New Year! 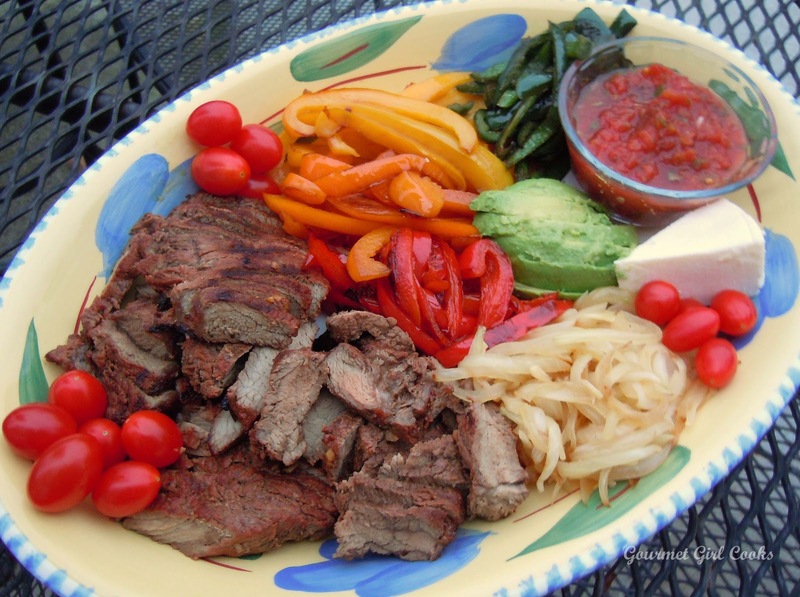 These fajitas look to die for! I wrote the other day about the chocolate cookies - happy to report my 6 year old LOVED them! Of course I do too :) I did add the extra Truvia (couldn't find swerve sweetner) and 72% cocoa bar. I'll try them less sweet next time and see if I get the same response. Question - when substituting Truvia for Swerve, is it 1 to 1? Do you have an opinion on one over the other? Thanks! Wow, I added WAY too much Truvia! Where do you buy the Swerve? On Amazon, they charge a fortune to ship it. Whole Foods doesn't have it either. I have ordered Swerve directly from their website, from Amazon and from Whole Foods. The Whole Foods closest to me sells it. I wonder if you asked your Whole Foods or the grocery store that you shop at to order it for you, if they would? Our Publix grocery stores will place special orders for customers. I agree the shipping is ridiculous. I have occasionally seen specials on Swerve, but not very often. Their website has a place to put your zipcode and tell you the place closest to you selling it -- but it doesn't work when I put in my zipcode. Hope you can find it so you get to try it. I was thrilled to find it at Whole Foods (after paying the shipping charges before). Awesomeness! About how big a pan are you using for the wraps? About what size should I expect. I'm totally making these! P.S. -- I do think a 10-inch skillet would work too! Thanks so much. I'm making these today and will let you know how much I like them! I have to get the golden flax meal, I have the regular, which I'm sure would work too. You so clever! You are welcome! Regular brown flax would work too -- it just has a stronger "flax" taste than the golden flaxmeal does. If you have a Costco that you belong to, I buy mine there and get a 3-lb bag of organic ground golden flax for $7.99 which is a great price. Many people prefer the milder taste of the golden flax but either would definitely work! I haven't made this yet, but I certainly plan to! I'm not much of an "experimenter" in the kitchen ... most of my creations flop so I gave up a long time ago. However, you’ve sparked an idea. I found my cannoli forms years ago at a local kitchen shop. I’ve lost track of them, though. Would have to perform a full-scale search, I suppose. Or just order from Amazon ... would probably be a lot easier. They’re still pretty inexpensive, looks like. What I also wonder is...to bypass making the tube type shells -- is there a way to make little mini shells like in a mini muffin pan and bake them to crisp them and then fill them with the filling....sort of like "cannoli bites"... I wonder if that might work too? By the way, your Saturday breakfast is gorgeous ... yum!!! I'm thinking that adding a little bit of almond flour to the coconut/butter/sweetener/cinnamon might help bind it together and make it easier to press into the pan. Just enough to make a light dough. LOL -- no problem at all Cybersis! Do you have a specific cannoli recipe in mind to convert? I really don't have a specific recipe in mind, although, come to think of it, some of the cannolis I was acquainted with growing up had a bit of cocoa powder in the shells, too. As for the filling, I never knew about the pastry cream version until much later in life. After giving it a whirl I found I really did prefer the "traditional" ricotta filling, but that's just a personal preference thing. Well, I've got to clear my head of cannolis for tonight ... I'm up *early* tomorrow a.m.! My fiance and I made the Tex-Mex Fajita Wraps tonight. They were great and by the fourth wrap we had mastered the shape and cooking. I am by no means a knowledgeable chef and have a silly question. What kind of salsa do you use? The only kind we had was a super hot Tapatio and although the wraps were good I was wondering what you use as the spicy kick was too much for me. 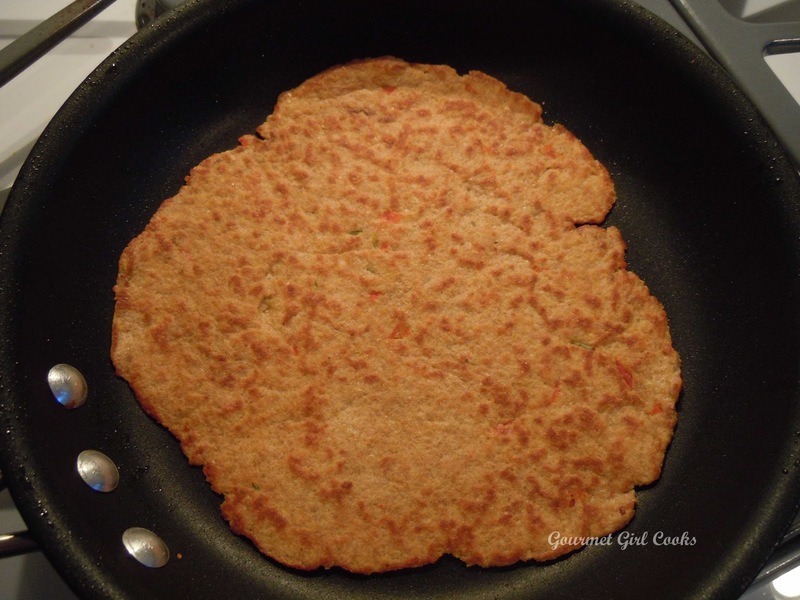 Thanks for the inspiration in your recipes and helping to keep the wheatless on track!